With the Queen’s visit to Ireland making headlines around the world this week, an unusual piece of Irish political history is attracting interest from antiques collectors. 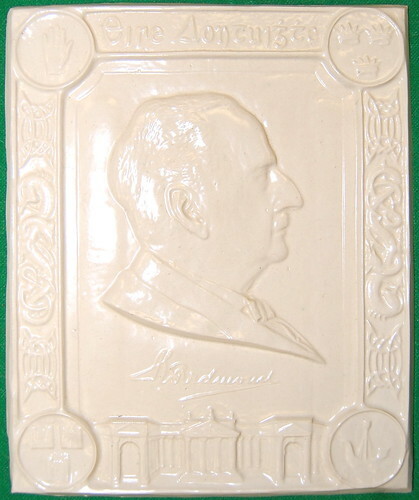 Being offered for sale by auctioneers Moore Allen & Innocent in Cirencester is a glazed pottery plaque produced by Booth & Brooks Ltd of Burnham on Crouch in 1914 depicting the politician John Redmond, together with Gaelic writing and symbols. For the uninitiated, Redmond (1856-1918) was the leader of the Irish Home Rule Party, who campaigned for self-governance for Ireland as part of the British Empire. The success of his campaign almost led to civil war, as loyalists in the north founded the Ulster Volunteer Army to oppose home rule, using force if necessary. In response, the Irish Volunteers was formed in the south. The execution by British forces of the nationalist rebels who led 1916’s Easter Uprising led most of his supporters to switch allegiance to the hardline Sinn Fein. Redmond died in the year that Sinn Fein won the majority of his party’s seats in the general election. At £50 to £80, the artefact carries one of the lowest estimates at the Selected Antiques Sale, which begins at 10am on Friday, May 27. The highest estimate is reserved for an oak refectory table by Robert Thompson of Kilburn, better known as The Mouseman for his signature trademark of a carved mouse on every piece of furniture he produced. 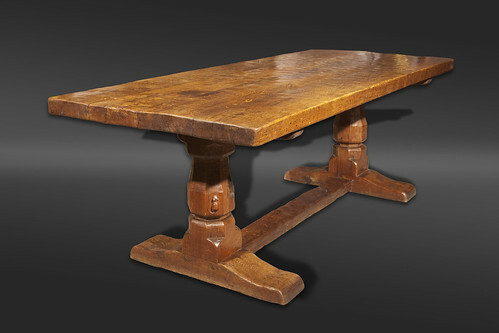 The 214cm long oak table is believed to have been made in around 1920, making it one of Thompson’s earliest professional commissions. And, says auctioneer Philip Allwood, it’s the best Mouseman table he’s ever seen. The auctioneer is equally smitten with an oak sideboard by Thompson, from around the same period. The alignment of drawers and cupboards makes this piece unusual, if not unique. Sideboards by the craftsman usually have a set of drawers flanked by cupboards. This example has a narrow column of three small drawers down each outside edge, while the signature mouse scuttles up the left hand side. A bid of £8,000 to £12,000 should secure the lot. 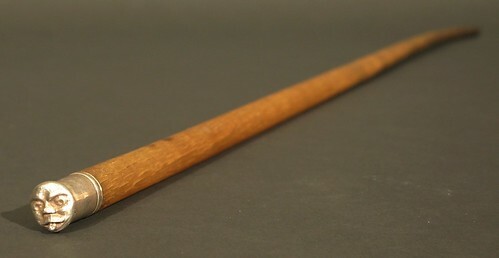 Rhino horn antiques continue to attract a lot of interest, and an early 20th century swagger stick, topped with a white metal grotesque mask, is no exception. At 72cm long, the horn must have come from a mighty bull rhino. Bids of between £1,000 and £1,500 are expected. Like rhino horn objects, anything made of silver or gold is commanding high prices at the moment, due to the value of the base metal on the commodities markets. The very large selection of gold and silverware includes everything from an early 20th century hallmarked flask by Thermos – for the rambler who has everything, one must suppose – at £30 to £50, to three George V nine carat gold cigarette cases, each of which is expected to make upwards of £1,000. 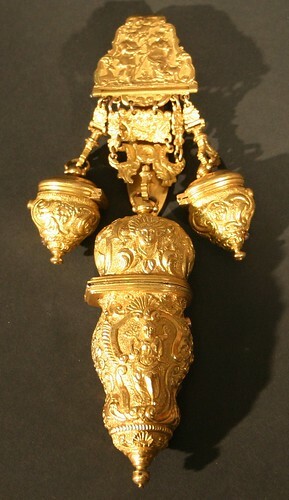 But the auctioneer’s favourite is an 18th century gold chatelaine, with a history as fascinating as its delicate Rococo decoration. A chatelaine is, to all intents and purposes, a Swiss army knife for rich ladies of the 1700s. This one contains a small pen knife, scissors, ivory tablet with pencil inscriptions, and more, and comes in its original leather covered case. Within the case was found a handwritten card explaining: “The words written on the ivory tablet in this chatelaine are by Jane Falk whose parents opposed her marriage. The gold artefact, weighing in at 104 grammes, is expected to sell for between £2,000 and £3,000 to an incurable romantic.